Panteras de Miranda (LPB) added to their roster experienced 37-year old Venezuelan ex-international power forward Luis Julio (201-110kg-80). It is actually his comeback to Caracas as he has played here before. Julio is a dual citizen owning also Colombian passport. He moved there from played at Las Animas in Chilean Liga Nacional where he started the season. In 42 games he had 13.5ppg, 10.2rpg (#5 in the league), 1.9apg and 1.0spg this season. Julio helped them to win the league title. 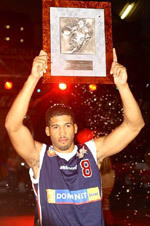 A very spectacular season in his career as he was selected Latinbasket.com All-Chilean Liga Nacional Center of the Year, named to 1st TeamLeague Player of the Week. 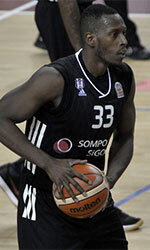 He ended the last season at Metropolitanos (LNB). But the most of that year Julio spent at Fast Break in LPB. In 24 games he recorded 9.1ppg and 6.8rpg. He contributed to his team winning the regular season and make it to the final. Julio was a member of Venezuelan international program for some years. He was called to Venezuelan Senior National Team between 2003 and 2009 and previously for U21 National Team in 2000. Julio has played also professionally in Brazil, Colombia (Barrancabermeja Ciudad Futuro, Islanders and Caciques) and Venezuela (Bucaneros, Falcon, Guacharos and Cangrejeros). He is close to retirement age as a player. It's very possible he may end his playing career at Panteras. On Julio: A swingman who can spend time in 3 and 4 positions; his athletic skills allows him to guard higher opponents and to help his team inside, even if he is undersized; he's also a good rebounder;.